Read an excerpt of the April 2015 article below. The Euro Stoxx 50 Index (Figure 2) is essentially the Dow Jones Industrial Average of Europe. It consists of big names such as BMW, Bayer and Siemens. It is a reliable proxy for overall social mood on the continent. Notice that the trends in this index differ substantially from the Dow and S&P 500, which are both hovering near all-time highs. The Euro Stoxx 50, in contrast, reached its all-time high back in 2000. There was a lower countertrend peak in 2007 and another partial retracement thereafter. But the index still remains net down from its peak in 2000. So, in essence, Figure 2 represents 15 years in which the net trend of European stocks and social mood has been toward the negative at large degree. We can break this period into distinct eras. The first is the “Enactment Era,” when the early dream for a united Europe came to fruition. During this period, the European Central Bank was established and the euro was launched. The Treaty of Nice, signed on February 26, 2001, cleared the way for Europe to expand into the Eastern Bloc. But the wave of positive social mood had already crested. 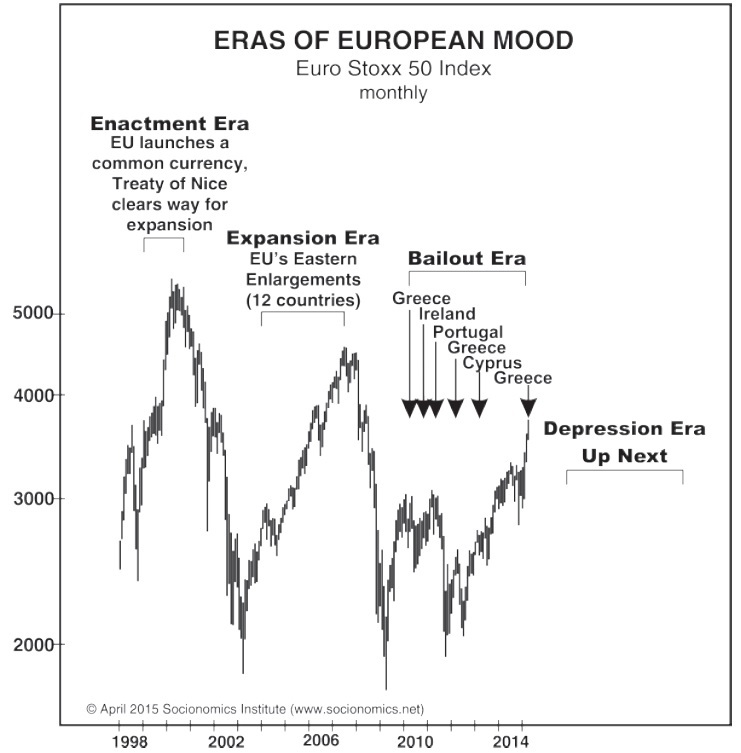 Mood continued to trend negatively in 2001, and the EU did not expand eastward immediately. It waited until another positive surge in mood began, represented on the chart by a sizeable countertrend rally in stocks. The social mood behind that rally also fueled the “Expansion Era,” which ran from 2004 to the 2007 peak in stocks. It was the largest EU expansion in terms of people and land mass, but it was the smallest expansion in terms of GDP. The 2007 peak in stocks is a critical marker because a substantial amount of progress that Europe had made over the previous decades started to come undone in the ensuing bear market. The “Bailout Era” followed the initial stock market decline. It began in May 2010 when Greece was first bailed out. Bailouts followed in Ireland, Portugal, Greece again in 2012 and Cyprus in 2013. Greece is now negotiating its third financial rescue. 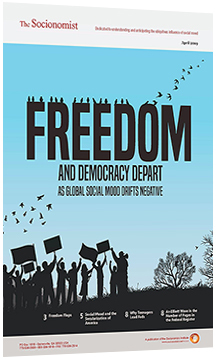 Continue reading this 7-page article to discover other manifestations of the large-degree negative social mood trend in Europe. Learn how you can seek shelter from the next wave of the storm.